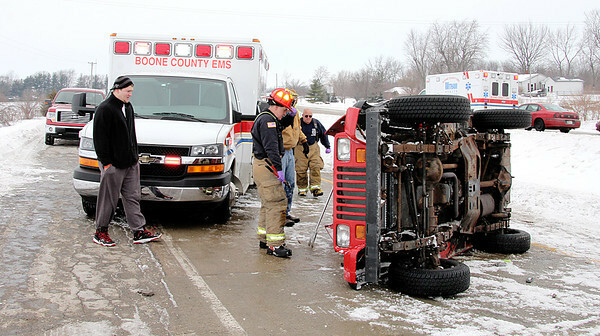 Andrew Hale, Indianapolis, a passenger in this Jeep Wrangler, was thrown from the vehicle into a snow bank after the driver, identified by police as Brandon Gillam, Indianapolis, in black jacket at far left, lost control on snow-covered north bound U.S. 52 just past a bridge over Interstate 65 about 11:30 a.m. Monday. Gillam was not injured. The extent of Hale's injuries was unknown at press time.